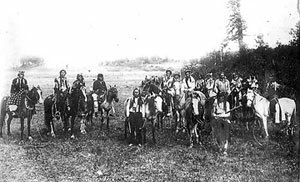 In addition to being the "Mountain People", the Ĩyãħé Nakoda are known as Yéθka, Yéθkabi, or Iyéθka. These terms mean "Those Without Blemish". According to our oral history, we were the "primary" people. All other humans were "secondary". When certain situations arose, those among the "secondary" humans, that were considered to be enemies of the Yéθkabi, were to be wiped out by whatever means necessary. Historically, we are also called the more formidable name of Wapamakθé. It means "Head Decapitators". The mere mention of the name Wapamakθé issued a warning to the warring enemies of what was to transpire. Such a fearsome reputation served notice that we, the Ĩyãħé Nakoda, would always maintain and defend our traditional territory. If the Ĩyãħé Nakoda were camped in one place temporarily, a round hole approximately 12 inches deep and 24 inches across was dug. The hole was lined with rawhide. This became a "pot". If the Ĩyãħé Nakoda were camped in one place for an extended period of time, four wooden stakes were driven into the ground. A buffalo paunch (stomach) was then suspended onto the stakes. This became a "pot". Using separate buffalo paunches, water was fetched from a nearby creek and poured into the pot. Meanwhile, medium-size stones were selected and placed over flames of a fire to heat. The hot stones were removed from the fire with forked saplings and placed into the pot. The water boiled instantly. Fresh cuts of meat were placed in the boiling water and then quickly removed. The meat was served as a meal, and the broth was also consumed. Depending on the number of people in the encampment, more than one cooking pot was utilized. This age-old method of cooking with stones resulted in non-Indigenous peoples referring to the Ĩyãħé Nakoda by the contrived name "Stoney". Over the years this name has evolved, and the Ĩyãħé Nakoda are more recently referred to as the Stoney Nakoda First Nation. However throughout the world, Indigenous peoples are reverting to their names of origin. For the Ĩyãħé Nakoda, the name "Stoney" is gradually being eliminated from common usage. In accordance with our distinct Ĩyãħé Nakoda heritage we, too, are rightfully restoring and preserving our authentic identity.